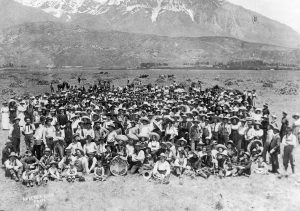 Known as “sagerooters,” this 1907 student crew helped clear sagebrush from BYU-owned land in what is now Orem. On this particular workday, students were serenaded by the BYU Band as they worked. Before it was the HBLL, it was the J. Reuben Clark Jr. Library. And before that? It was a bunch of steel crosses. A snap of BYU photojournalism class in 1957. This is ladies’ P.E. in 1923.